Your goal may be graduate school, research, medicine, veterinary science or the biotech industry. Whatever your path, come to William Woods University in Fulton, Missouri for bachelors programs in science — biology, physics, math, psychology — that will prepare you through sophisticated facilities, small classes, close mentoring and collaboration, plus an emphasis on hands-on lab work in nearly every class. Our B.A. and B.S. math and science degree programs are designed to give you curriculum flexibility so you can tailor your education for graduate school, research, teaching or a business career in science. William Woods University has experienced a 100 percent acceptance rate for students who have applied for advanced professional degrees in veterinary medicine, medical school, pharmacy and physical therapy doctoral programs. 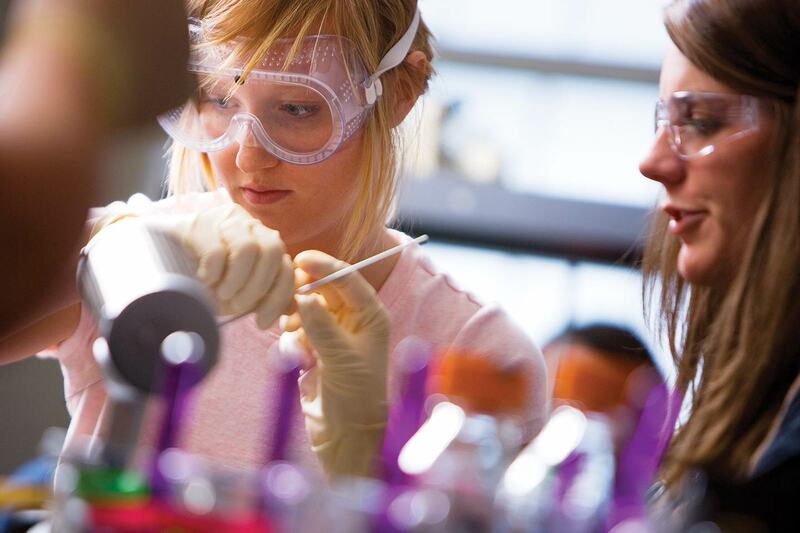 We offer Bachelor of Science in Biology concentrations in pre-veterinary and pre-medicine. I honestly don't know whether I could have made it without the biology department. They were always there for me. — Danielle Propst, B.S. in Biology, ’14 and now a Pharm. D. student at University of Missouri - Kansas City, Mo. The staff here did not hesitate to help with whatever I asked of them, whether it was proofreading my application, performing mock interviews, or writing reference letters. — Cody Kern, B.S. in Biology, ‘13 and now a medical student at University of Missouri School of Medicine. Gain essential knowledge and skills to pursue careers in health professions, pre-med or pre-vet, research, business and more. Develop a physics foundation and crucial critical thinking skills, as well as laboratory, research and analytical know-how for a wide variety of careers. Build a strong foundation in various areas of psychology for success in graduate school or a number of careers.